Quincula lobata (Torr. ) Raf. Also Called: Plains chinese lantern. Stems: Prostrate or decumbent, much branched, ridged, very leafy, covered with microscopic, white, crystal-like bladders. Leaves: Alternate, simple, stalked, oblanceolate to spatulate or elliptic, 1.5 to 4 inches long, .25 to 1 inch wide, somewhat fleshy, surface covering similar to stems; margins wavy. Inflorescences: Solitary flowers in leaf axils, stalks slender, .25 to 1 inch long. Flowers: Typically facing upward; calyces bell-shaped, 5-lobed, lobes triangular, tips pointed; corollas flat, wheel-shaped, .5 to 1 inch wide, deep or pale purple to bluish purple, throat often with purplish or reddish veins; stamens 5, anthers yellow. Fruits: Berries, spherical, greenish yellow, enclosed by inflated, papery, 5-sided calyx envelope; seeds few, dull, rough, yellowish brown. 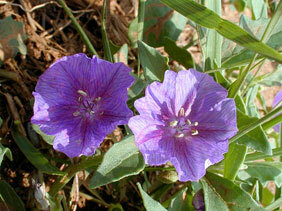 Habitat: Open prairies, roadsides, waste areas, canyons, and dry barren places, on sandy or gravelly soils. Uses: Native Americans made jelly from the berries. Comments: Purple ground cherry forms low-spreading mats from rhizomes and is very drought resistant. The name "Chinese lantern" comes from the papery, lantern-shaped seedpod.